With fresh statistics and two new chapters, author Mike Falkenstine is proud to present the second edition of his book, The Chinese Puzzle. Falkenstine has felt a direct leading to help you understand China and her Church. There is much confusion. Does persecution exist? Can Christians in China worship freely? As a Westerner, how may I most effectively pray for and engage in China? Many people are confused by these questions and issues. China is like a huge puzzle, with many pieces and moving parts; it's hard to identify all that is happening today in China. China is experiencing some monumental, head-spinning changes, and even the most discerning China analyst may find it daunting to keep up. Information flows from multiple sources, and much of it seems contradictory; this doesn't facilitate our understanding of China and her church. There are also some in the West who pose as 'China Experts, ' even though they haven't been to China in many years, they don't speak the Chinese language, and they are therefore functioning with old paradigms which foster old stereotypes of China. 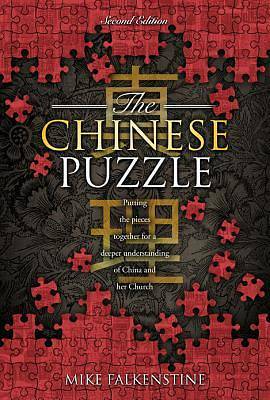 In writing this book, Falkenstine hopes to give you many more pieces to the puzzle that may deepen your understanding of China and thereby Christianity in China. With many more pieces to the puzzle, he believes you will be able to pray more effectively for China, engage with what God is doing there, and see China from a much more balanced perspective. As we finish the first decade of the 21st century, the situation in China is ripe for increased Western engagement based on mutual understanding, and he hopes this book serves as a catalyst to strengthen and deepen that understanding. Chapter two looks at the current trends that are changing China, from the inside out. These changes and developments are important for our understanding of China. This may be a surprising chapter, as you learn some of the groundbreaking efforts taking place, including the rapidly emerging Christian book publishing efforts that he details for the first time in the second edition. As you may know, the Chinese people have different social and moral standards than we have in the West. In Chapter three, we will examine these differences. If we want to understand China, we need to recognize their relational differences and social standards. Chapter three also investigates the Chinese view on legality and the Rule of Law. Chapter four examines what he calls the 'Persecution Myth' the false belief that Christians in China continue to suffer massive persecution for their faith in Christ. Persecution does not happen as much as we may think, and we must change our paradigm. Westerners who live in China and work with the Chinese church know that persecution is no longer the headlining story. We will look at the reasons the myth continues to persist and the organizations who don't want the myth to die. Chapter five was born out of the intense coverage some Western ministries and Christian media have been giving to one of Beijing's over 3000 unregistered 'house' churches. In travelling regularly to Beijing, he was hearing that most of Beijing's Unregistered Churches were operating without interference with the Beijing government officials. What I found will quite possibly change your opinion of not only Beijing's Unregistered Churches, but also Unregistered Churches nationwide. For anyone who wants to become actively involved in God's work in China, Chapter six can become your guidebook for involvement. You can read about new opportunities to work transparently, a new 'industry standard' of engagement, and a practical guide for getting started in China. Chapter seven will educate you on China's Ethnic Minorities. What he found out what not only fascinating, but also has broadened my understanding of the overall work that God is doing in China and the obstacles that lie before us as we desire to impact China for Christ. One of the other keys to our understanding of modern-day China is being able to see China and life through the eyes of the Chinese themselves. Through his work with the China Resource Center, he talks to many Americans about China. Through these countless conversations, he can see the inaccuracies in people's thoughts and perceptions about the lives of today's Chinese. By painting with broad strokes, Chapter eight will clarify the overall picture of how the Chinese view their government, life and democracy. In Chapter nine, Falkenstine uses his twenty years of China service to give an overview of his work in China and an introduction to the work of the China Resource Center, including a great new project that they've engaged in since the first edition of this book. In Appendix A, you'll find the complete text of the Ethical Foundations for China Service, created by a number of China ministry leaders at Fuller Seminary in June 2006. This document provides a standard of best practices in China, both for China-interested organizations and individuals. We hope that you may take the Foundations into your own organization, and use it as a discussion starter and a point of dialogue about most effective practices in China. It has proved to be an invaluable tool for many organizations and he'd recommend it to anyone or any organization just starting out in China.